Q: “Every day we’re out there making …” ? A: Not money, it’s Duck Tales – Ahhwoohoo! A few weeks ago I came home from work to see that my wife and son had checked out Duck Tales Season 3 Disk 2 from the library. I think I was the only one who was genuinely excited about it but my son decided that he loves Duck Tales after the first few episode. I tried explaining the concept of Saturday morning cartoons to him but I think that went over his head a bit. While I watched these old cartoons that I use to watch when I was little I was amazed at how much financial information they had scattered into the storylines. One of them was about Uncle Scrooge falling in love with the wealthiest woman in Duckberg and all of their words or affirmation and pet names were based on financial terms (i.e. “Oh, my Long Term Investment, you make my dividends rise.”) Basically all of these were things that would be way over the head of the intended audience but as a financially minded adult I found them hilarious. 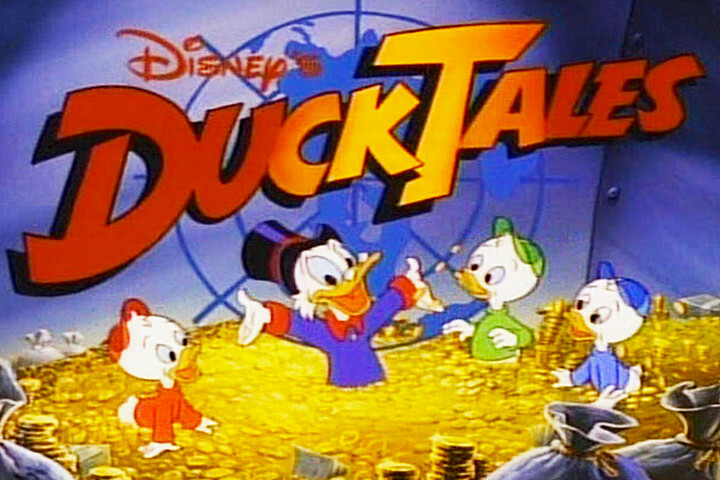 While watching this episode it made me start thinking about how much financial conditioning I must have received from watching cartoons like Duck Tales as a kid without even realizing it. So, I got out a piece of paper and started writing out the top 10 lessons that Duck Tales taught me about money. 1. Always find a way to turn a profit – Scrooge always boasts that he has never lost money on a business venture but when he invested a ton of money in a lost cause hotel it starts to look like his high risk venture is going to ruin his winning streak when he unknowingly allows a monster convention to book the new hotel for the night. They first destroy the hotel then move the party to Scrooge’s mansion and begin to destroy that as well. But that clever old Scrooge refuses to cut his losses and instead he is able to contrive a way to capitalize on the real monsters as a publicity stunt to sell out every showing of monster movies at the theater that he owns. This unexpected theater revenue then provides him with enough to cover all of the costs incurred due to the damage and getting the hotel up and running in the first place. 2. It only counts if you earn it fair and square – Scrooge is constantly trying to teach his nephews that if you have to steal or cheat your way into wealth that it doesn’t do you any good. That the effort and knowledge required to earn the money is the most valuable part of being rich, because it means that you can get there again if something happens that causes you to lose all of your money. 3. “Work smarter, not harder” – This lesson came from the episode that tells how Scrooge first went from being a pennyless bagpipe player to being able to swim in his gold. He says that the motto that his dad use to always tell him was to work smarter, not harder. And by finding ways to work more effectively he was able to increase his productivity and thus start making the money that he needed to get started on his path to riches. 4. Sometimes you just have to trust in luck – In the same episode as before, we find out that Scrooge had made quite a bit of money by working smarter but then spends everything except for his lucky dime on a speculative timber operation in Oklahoma, only to get there and find out that there is no timber on the land that he bought. And, to make matters worse, that he is now indebted to the guys he hired to build a train track to move the supposed lumber. The disgruntled workers chase him intending to take their pay out of his skin. But during the chase Scrooge tries to hide his lucky dime under a big rock and ends up discovering oil. And it’s this accidental oil operation that allows Scrooge to begin really building his wealth. Sometimes all the planning in the world can’t beat out dumb luck. 5. Set goals then go after them – Scrooge is never idle. He is constantly making plans about how to make more money, then going out and doing something about it and not just waiting around for good things to come his way. 6. You’re never too rich to be thrifty/frugal – In one of the episodes Scrooge’s nephews notice someone selling sodas for 5 cents each and ask Scrooge if the can get some. He says sure, then hands them one nickel. They seem disappointed that the three of them are going to have to share one soda but then Scrooge reminds them to get four straws, one for him as well. He was trying to teach the boys that just because you can afford something doesn’t mean that you shouldn’t always be on the lookout for ways to be frugal. 7. Financial vocabulary – This cartoon follows the financial endeavors of a business mogul so every episode is based on some sort of financial adventure. This allowed the creators to scatter financial concepts and the associated vocabulary throughout every episode. 8. The pursuit of money can become all consuming – While Uncle Scrooge might have several redeeming qualities he also has his vices. Often it seems that he allows the pursuit of a dollar to occupy all of his life and rarely takes the time to stop and enjoy the fruits of his efforts. It made me realize that we too need to slow down and enjoy ourselves every once in a while and have at least a few moments each day when we refuse to allow ourselves to feel the stresses of chasing after a greater net worth. 10. No matter how much you love accumulating wealth, some things are more important that money –Even the infamous Scrooge would have to admit that there are some things that are more important to him than money. A few times in the episodes that we watched Scrooge is forced to make a hard decision and admit to himself and the audience that he would rather sacrifice the treasure that he had been hunting rather than allow something bad to happen to his family, friends, or reputation of honesty and integrity. I think that this is one of the main points that the creators were trying to teach us as kids, that money is needed but there are some things in life that are more valuable than all of it. I totally wanted a money bin as a kid! Ducktails was the bomb .... Uncle Scrooge knew what was up. "Work smarter, not harder" was definitely a good take away from that show.